When I wake up in the morning, I check my phone. First things I want to know: Is everyone is ok? Were there any emergencies overnight? Did TTIV get any new subscribers? I mind the important things. Today, I had about 75 messages in my personal email account. 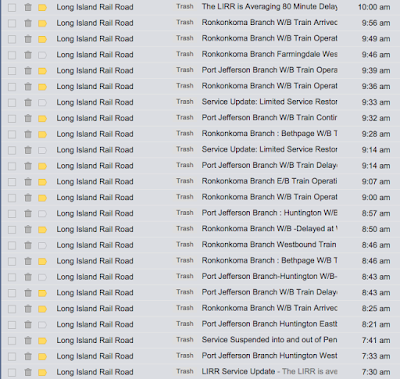 When my inbox is this clogged, I know that the Long Island Rail Road is attempting to share their latest service troubles. The LIRR is terrible at communicating concise information, so they overcompensate with a barrage of endless messages that do not stop until the situation is resolved. What kind of messages do they send? Take a look at Exhibit A, which shows my inbox from 7:30 AM until 10:00 AM. Those emails were all sent within several minutes of each other. 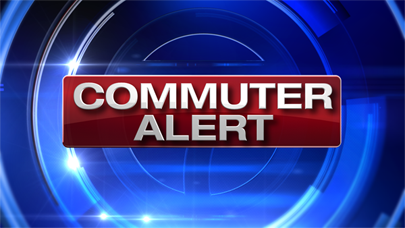 LIRR is experiencing 80 minute delays system-wide! No trains in and out of Jamaica! Some trains in and out of Jamaica! Don't even think of going to Jamaica, unless you're going to the one where Bob Marley lived! Locusts! Frogs! Slaying of the first born! Most of these emails were useless to me. I open one or two and get the gist of the problem from it, and then use my phone's "bulk delete" service to quickly remove them. What happened today? There was an electrical problem, supposedly caused by Amtrak. As a result, trains couldn't go through the tunnels. Got it. There's nowhere else to turn for information; I follow the LIRR on both Facebook and Twitter, but they never provide any useful information. And news site updates are always stale. 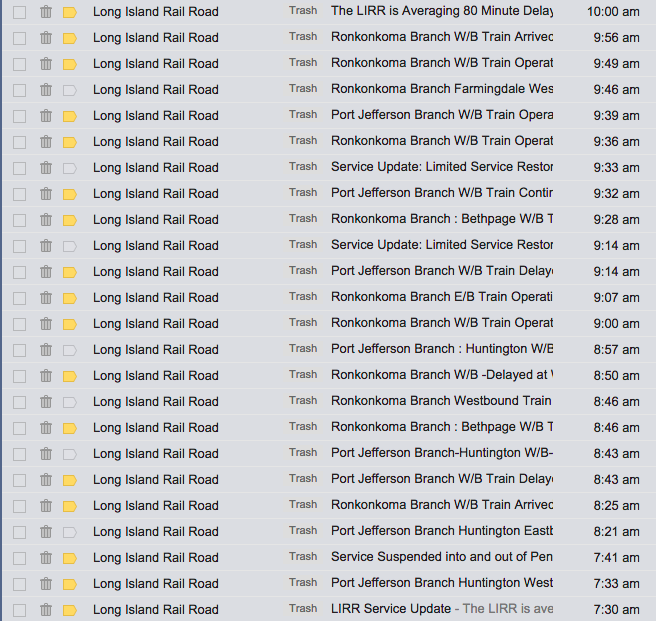 By the way, I'd like to recognize the LIRR for their single greatest efficiency: diffusing blame and accountability. Whenever there is a problem, it's always Amtrak's fault. And why not? The LIRR gets to lighten some of the blame burden, and Amtrak couldn't care less if the LIRR is snarled. Everyone wins! Well, everyone but the commuter. By most accounts, today's commute was a disaster, but if I may defend the LIRR just a little, things happen. Stuff's going to break. What was controllable and inexcusable was the handling of the messaging to the commuters. The LIRR botched it again. Why is it so hard to disseminate information through a defined set of channels? Don't we pay enough in fares for the MTA to designate a competent communication czar who passes the information to the conductors, station announcers, and social media sites? Why does everyone walk around comparing varying and vague information they've gotten from various sources? Forget I even asked. I'm not going to try to figure it out anymore. I'm on vacation until next week. Good luck to everyone Thursday.